A beam begins to bend. When floor joists weaken and bend, the floor above your crawl space will be uneven and bouncy. Your crawl space is an essential part of your home's structural support. Crawl spaces bear the weight of rooms above and are connected to the foundation, which is why damage in the crawl space can have a significant impact your home. Many crawl spaces have inadequate support, are decaying due to mold and water issues, or are sinking because of soil settlement. When one or more of these issues happens in your home, you will notice sagging floors above the crawl space that could eventually break down if not repaired. At Woodford Bros., Inc., we specialize in crawl space repair of all types. If you're experiencing a structural problem with your crawl space, we have a solution for you. Call us today at 1-855-203-6835 or contact us online to learn more! We offer free estimates in Rochester, Binghamton, Syracuse, Utica and surrounding areas. When joists in the crawl space begin to sag because of age, mold, or pest damage, the floors above them will sag as well. This leads to uneven or "bouncy" floors in the living space, which are unpleasant for you and your family to deal with and damage your home's value. The SmartJack® from Woodford Bros., Inc. is the solution to these problems. SmartJack® crawl space support posts provide an effective, durable solution for leveling and stabilizing damaged crawl spaces. Unlike concrete blocks that will only sink further into the ground, the SmartJack® provides a permanent solution. This crawl space support system is made with strong, corrosion-resistant, galvanized steel. This ensures that it won't develop rust or be damaged by pests. SmartJack® posts are installed on sturdy base that prevents further settlement. Most importantly, they are easily adjustable should you ever need to change their height. SmartJacks™ are completely compatible with our crawl space encapsulation system. Wondering how the SmartJack® stacks up against other crawl space structural repair options? The table below highlights the reasons the SmartJack® is the best choice for your home. Worried about the structural integrity of your crawl space? Look no further than the professionals at Woodford Bros., Inc.. As your local crawl space repair experts, we can evaluate your home and install durable SmartJacks™ to ensure your home has stable, level floors. Call us today at 1-855-203-6835 or contact us online to learn more about how we can repair all your crawl space problems. 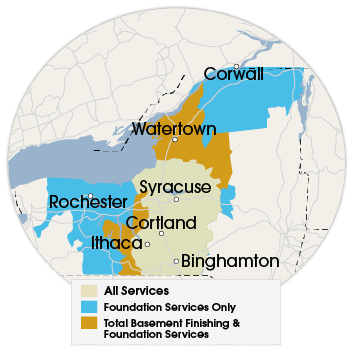 We offer free estimates on all our work in Utica, Binghamton, Rochester, Syracuse, Ithaca, Liverpool, Ithaca, Rome, Elmira, Endicott, Auburn, Watertown and throughout the surrounding areas.